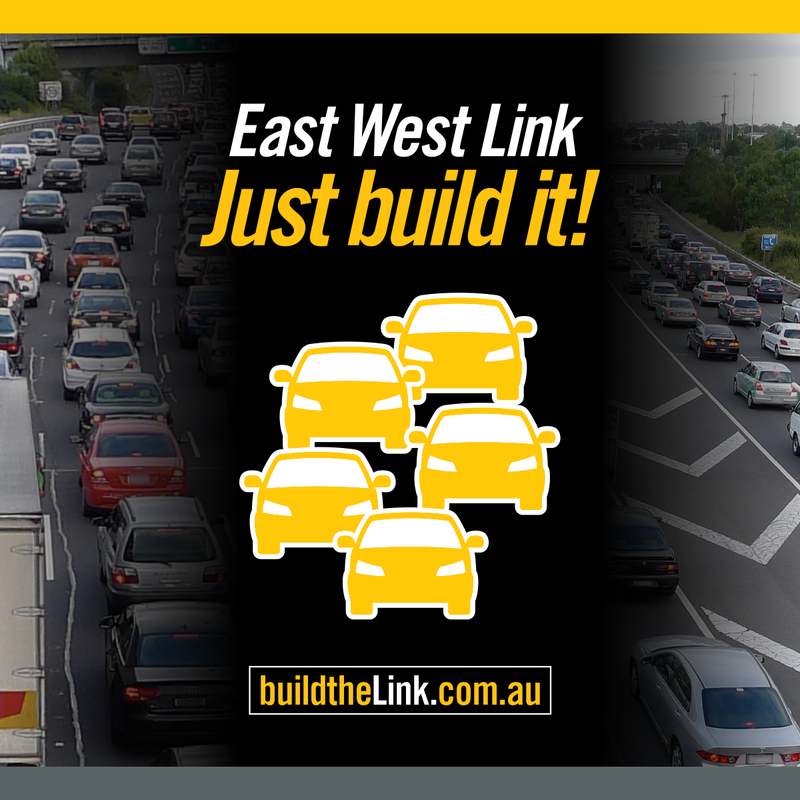 The only way to improve the crippling traffic congestion in Melbourne’s eastern suburbs – we must build the East West Link NOW. Now, more than ever, the campaign to build the East West Link needs strong support. Thousands of vehicles already come to a screaming halt at the end of the Eastern Freeway, and building a North East Link will only pour thousands more vehicles into the bottleneck. The Federal Government has set aside funding for this shovel-ready project, which can start today and create 6000 jobs. Infrastructure Australia lists the East West Link as a national high priority and the RACV names the end of the Eastern Freeway as Victoria’s number one trouble spot. While Labor may have destroyed the contracted East West Link, an East West Link will be built in the future. It’s too important for Victoria’s future. Commuters and businesses just can’t afford to be stuck permanently on Labor’s gridlocked roads. If the road is not built hardworking Victorian commuters will be forced to spend more time stuck in traffic, instead of enjoying more time at home with their families. Labor’s decision to scrap the East West Link cost at least $1.3 billion – for nothing, no road and no jobs. It’s madness, and it’s unforgivable. Follow the steps below to make a stand for better infrastructure and less congestion! Send Bill Shorten & Daniel Andrews a message! Just build it! Get us moving! Melbourne’s traffic congestion is getting out of hand. Now, more than ever, we need to build the East West Link. Please listen to me when I tell you that congestion on the Eastern Freeway is getting worse by the day and we must act to stop our city from choking. Unlike other road projects, the East West Link is shovel-ready – construction can start tomorrow to get Melbourne moving again and create thousands of jobs. The Federal Coalition Government has $3billion on the table to build this vital piece of road infrastructure. I am calling on Labor to listen and just build it! Melbourne’s traffic congestion is getting out of hand. Now, more than ever, we need the East West Link. 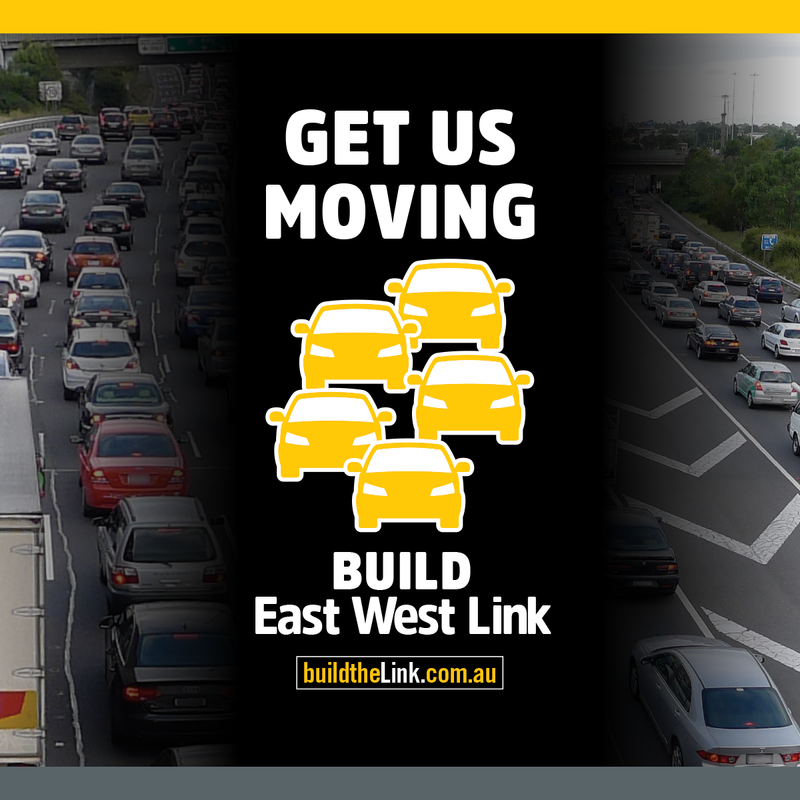 Please listen to us when we say that enough is enough – congestion on the Eastern Freeway is getting worse by the day. Unlike other road projects, the East West Link is shovel-ready – construction can start tomorrow to get Melbourne moving again and create thousands of jobs. The Federal Coalition Government has $3billion on the table to build this vital piece of road infrastructure. I am calling on Labor to listen and get us moving! SHARE on Social Media to build the link!